You are invited to the Alberta Federation of Labour (AFL) sponsored Brunch to remember the 14 women killed in the Montreal l’École Polytechnique massacre, so that we can continue to fight for a world without violence against women. The December 6, 1989, Montreal Massacre brought the issue of violence against women to the forefront with chilling clarity and galvanized Canadians to take action. For women and men across this country, December 6th has come to symbolize the reality of violence that women live with every day – be it domestic or workplace violence, sexual assault or harassment. 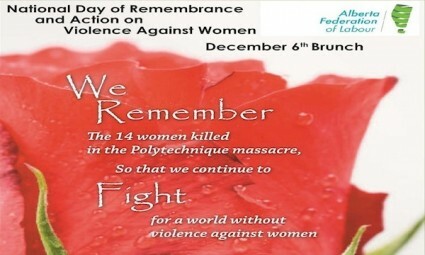 In October 1991, the federal government declared December 6th as the National Day of Remembrance and Action on Violence against Women. Funds raised this year from the AFL Brunch will go to Wings of Providence, a second-stage shelter for women and children. WINGS stands for Women in Need Growing Stronger. It is a non-profit organization supporting women with children who have experienced family violence. Key features of the WINGS shelter include: Child Care Program; group and individual supportive counselling sessions; counselling for children and teens to help them deal with the physical, psychological and behavioural challenges that result from having lived with family violence; youth programming to discuss life skills topics; opportunities for children to participate in recreational activities; an Outreach Program to assist families moving from WINGS; and a collective kitchen to learn nutritional, and cost-effective meal planning. Doors open at 10:00 AM, welcome at 10:45 AM, brunch at 11 AM, and speakers at 12 PM. Register online at www.afl.org and remit payment separately, or complete the Registration Form and mail, fax or e-mail to the AFL office: #300, 10408 – 124 Street NW Edmonton, AB T5N 1R5. E-mail: afl@afl.org Fax: 780.484.5928 ATTN: Linda Robinson. 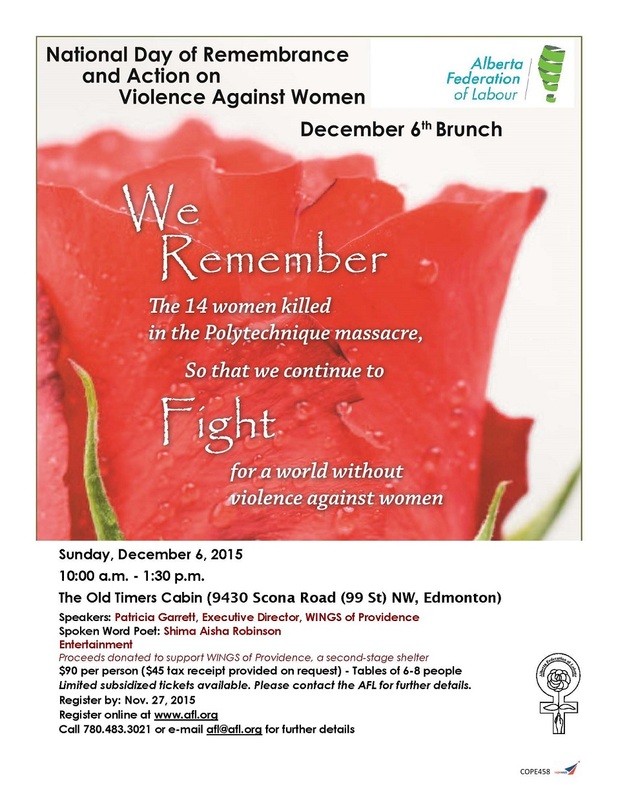 Cheques payable to the Alberta Federation of Labour (note Dec. 6 Brunch on cheque). The AFL is seeking door prize donations, if you would like to donate, please email Maureen Werlin at afl@afl.org.